A 1920 Montblanc 2 Safety eyedropper-filler in black hard rubber, with a white snowcap finial. What makes this example even rarer is the Montblanc “14 Carat 2″ nib with the die stamped “J” above the imprint. The “J” designates a very flexible calligraphy nib, this one in medium right oblique (shaped like left foot), flexible. Crisp cap imprint. Some barrel imprint wear (fully readable), otherwise near mint! Perfect for celebrating Montblanc’s 110th anniversary! 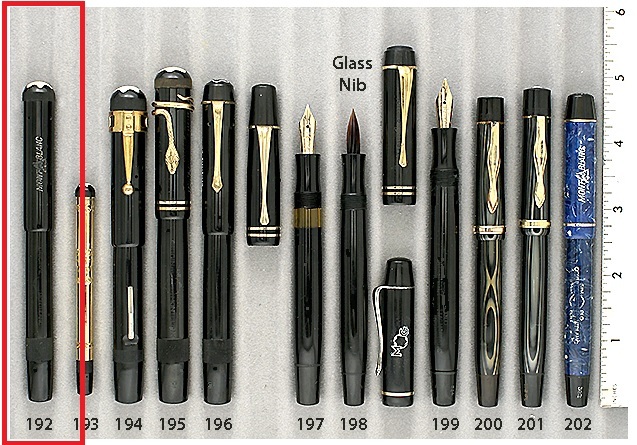 This entry was posted in Vintage Pens and tagged Catalog, Catalogs, Extraordinary Pens, Montblanc. Bookmark the permalink. Follow any comments here with the RSS feed for this post. Post a comment or leave a trackback: Trackback URL.